Constructs are the ways in which we project our view or opinions on the world around us. We effectively see the world differently according to our own set of judgements and values. An interview exploring these construct is a simple way to discover these constructs. We focus exclusively on how they see the world of work. The process can be quite enlightening as the individual explores their own perceptions of work and jobs. The activity involves polarising opinion between various options in order to explore the students constructs. 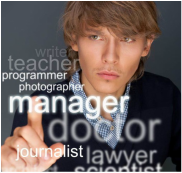 The process uncovers particular aspects of work that students are looking for in a job. We also discover some inherent values/motivators about the kind of work they want to do. We then explore these further to form a more developed view of the kind of work they would like to do. Students have a better understanding of themselves and how they view the world of work. The exercise also helps them clarify further which jobs are likely to more suitable to them based on the interview. We produce a write up from the interview with suggestions for further action.